We’d love your help. Let us know what’s wrong with this preview of The Plot Whisperer by Martha Alderson. Celebrated writing teacher and author Martha Alderson has devised a plotting system that's as When it comes to writing bestsellers, it's all about the plot. Trouble is, plot is where most writers fall down--but you don't have to be one of them. With this book, you'll learn how to create stories that build suspense, reveal character, and engage readers--one scene at a time. To ask other readers questions about The Plot Whisperer, please sign up. For what this is, it's pretty good. For whether it was helpful to me, personally, I'd say... no. So what WAS it? Exactly what it says. It refers to two different types of writers and allows for the differences between right-brained and left-brained individuals, saying, point-blank, that you've got to shore up your defenses. Good enough. Beyond that, we're dealing with the very basic ideas of keeping tension, not overwhelming the opening with too much backstory, keeping the descriptions strong and For what this is, it's pretty good. Beyond that, we're dealing with the very basic ideas of keeping tension, not overwhelming the opening with too much backstory, keeping the descriptions strong and not crazy, and best of all, the good stuff about the plot. Of course, she uses some of the classics like Lord of the Flies and Great Gatsby and even Hunger Games, but it all boils down to introducing great antagonists early (even if it's the main character), having them fail and come to their big realization at the 3/4 point, and then wrapping it all up. What is not covered is, say, the dramatic structure of Shakespeare's plays, the non-plot heavy character-driven classics, or anything much beyond the cookie-cutter. And most of the cookies are left out, too. Where I got the book: borrowed from a friend. Plotting is one of those aspects of novel writing that looks a lot simpler from the outside. New writers (and sometimes not so new) can find they have a great story in their head, have solid writing skills, a good command of dialogue, and a knack for description, but once they transfer their story to paper it just isn’t working. The middle’s saggy or the ending lacks pizzazz or the beginning is overloaded with backstory—if you hang around writing grou Where I got the book: borrowed from a friend. Plotting is one of those aspects of novel writing that looks a lot simpler from the outside. New writers (and sometimes not so new) can find they have a great story in their head, have solid writing skills, a good command of dialogue, and a knack for description, but once they transfer their story to paper it just isn’t working. The middle’s saggy or the ending lacks pizzazz or the beginning is overloaded with backstory—if you hang around writing groups for a while, you soon begin to spot the problems with everyone else’s writing, and eventually you begin to see it in your own. I don’t think a grasp of plotting should be confined only to novelists, either. Non-fiction writers, particularly those attempting a memoir, need to understand story-telling skills just as much as fiction writers do. Any story needs a structure. Of course there are those people called pantsers who just sit down and write, and tell you that they never do any plotting. I would argue that successful pantsers are just people who are very good at holding a plot structure in their heads, but I’d also advise keen plotters to sit down occasionally and try to write a story entirely without plotting it, just to see what happens. I’ve been trying that myself lately, and a couple of stories have emerged that will serve as concepts or foundations for novels, once rewritten in a slightly more orderly way. But enough about me. The Plot Whisperer struck me as a good place to begin as I started work on plotting a new novel (me again) and indeed, it proved to be of value. For copyright reasons I can’t show you the mind map I made using Alderson’s suggestions, but it’s pretty extensive—given that I threw a new item onto the mind map every time something Alderson wrote struck me as useful and the resulting mind map is huge, I would say that there is much of use to be found in this 233-page book. Alderson starts out describing the difference between left-brained and right-brained writers—I found that thought-provoking. Right-brained writers, as you’d expect, see the big picture of a story, while left-brainers have a more sequential approach and are good at writing out a story scene by scene. Interestingly, looking at my mind map I can see that Alderson is predominantly right-brained—she’s excellent at providing the reader with all the elements of a good story, less skilled in explaining how you go about the process of building a good plot step by step. Alderson does provide the reader with a visual representation of plot in her plot planner, which looks a bit like a sales graph. If you want to see this and other plotting visuals, visit my Pinterest board on the subject. Because there are other ways of visualizing plotting out there, any or all of which could be useful for your particular book, and maybe it’s Alderson’s that’ll resonate with you. I think if I look at all the story elements she talks about in the course of the book and map them onto the plot planner diagram she provides, I might see her method more clearly—but to actually embark on plotting out your own story via her diagram, you need something like a six-foot-long sheet of paper and a place to lay it out while you place sticky notes on it, which doesn’t work so well for me. She also provides a scene tracker chart example that could be easily replicated in any spreadsheet program and that’s good, but again my own brain doesn’t do too well with spreadsheets when it comes to novels. It’s too, well, spreadsheety (whereas, for example, I’m an Excel GODDESS when it comes to logging my word counts and analyzing how well I’m doing compared to my writing goals). What I mean by “the process of building a good plot step by step” is that whole business of how you get a story out of your brain and into decent shape on the page, preferably without having to rewrite too much (although Alderson is clearly a fan of rewriting, as she often refers to the (many?) rewrites you’re going to be doing as you craft your novel. Which is awesome for writers who either write VERY FAST or have a lot of time for writing, but for those under contract or obliged to sandwich their writing time in with other responsibilities, getting your plot structure/story right first time, most of the time is a valuable skill.) Most of us start with the bare bones of a story—how it begins, a few key scenes, and how it ends—and then we have to build flesh onto the bones by coming up with secondary characters, subplots and world-building. Having done this a few times, I can take Alderson’s plot elements and possibly map them onto her plot planner diagram as my own plot elements, but I’m not sure how clear that process would be for someone trying out plotting in the early stages of a writing career. The Plot Whisperer also suffered a bit from a tendency of all writing books, which is to veer off into tangents about what is and isn’t good writing. I think Alderson is right when she claims there’s such a thing as a Universal Story (which differs from one genre to another,) but there’s no such thing as a universal book or universal writing. Reading is an incredibly subjective exercise—how many of us are open-mouthed with disbelief because THAT book or THAT book are bestsellers and loved by millions, and we just KNOW they’re badly written? Are we gifted with some kind of superior discernment? For example, Alderson at one point introduces the notion of Constantly Escalating Tension, a concept that’s led to more bad Doctor Who episodes than I can count. Sometimes, and in some genres, the tension needs to be subtle and subterranean, a wander through a dark wood rather than a series of ever-greater perils with lots of shouting (and, in the case of Doctor Who, running). At times, I felt like I was being told how to write my book rather than how to plot it, and I want to hear about mechanics rather than specifics so such advice doesn’t work for me. I also had a bit of trouble with the ‘Writer’s Way’ sidebars, in which Alderson explains all the angst you, the writer, are going to experience as you hit point A or point B in your story. Really? Well, Alderson runs plotting workshops, so maybe her generalizations are the result of experience, but I’ve never suffered in these ways. She makes writers sound like a pretty neurotic lot—well, some of us are, but many of us aren’t. This is the most comprehensive book on writing I have read! Sometimes a particular book just sticks to me, 'The Plot Whisperer' is such a book, it gets down to the differences between 'pantsters & plotters' in a meaningful way. Want to go to the next stage in your writing? Grab hold of a copy of this book and you will leap forward in your quest to be a great writer. I hate to give any book one star, but this book...oh, dear. I was intrigued by the title and the author's bio, and was really looking forward to reading the book; unfortunately, that anticipation probably made the "let down" all the more disappointing. This book is poorly organized and meandering, the "mystical" undertones are bizarre, and the writing is not good (which is an even bigger sin in a book on how to write, in my opinion!). In addition, while I have great respect for basics and regula I hate to give any book one star, but this book...oh, dear. In addition, while I have great respect for basics and regularly like to refresh myself on the "building blocks" of good writing, the concepts in this book are so elementary it seemed the audience might be people who have never heard of books or writing before. The author makes a number of authoritative, definitive statements that are not authoritative or definitive, which made her credibility shrink and left me wondering if she knew what she was talking about at all. When the author references other works as examples, she has a tendency to summarize the entire book or short story--including the ending--instead of only mentioning the portion of the work that relates to the point she is trying to make. That is irritating for a couple of reasons--first of all, a writing teacher doesn't have to tell me the WHOLE story to explain why a piece of it worked, and second, any books or stories I have not yet read are now spoiled because the ending was unnecessarily revealed. p.46: (Describing someone who came to one of her writing workshops) "...her face crumbled and seemed to shapeshift into that of agonized child..."
Crumbled? Like skin crumbs fell off of her face? Really? Or did the author perhaps intend to write that her face "crumpled," which means "to sag and show an expression of desolation?" p. 48: "She doesn't belly up and lie down and take the abuse." Um...does she mean belly up as in go bankrupt, or to draw close to something? Those are the only options I can think of if she is going to use "belly up" as a verb instead of an adjective. p. 50: "He yearned to hold in his hands a novel he had written." That is just a sampling--and I haven't even mentioned the embarrassing number of cliches. As I mentioned before, I hate to give any book one star. I almost feel guilty giving this one a single star. However, if you are looking for a book to guide you through the writing process, an author to inspire you, and a demonstration of language usage that will make your heart soar like an eagle (yes, people, that cliche was intended as a joke), then this book is not the one. There's a caveat to this book's 5 stars - do yourself a favour and learn about structure first. Learn it well, then come to The Plot Whisperer. Once, a philosophy teacher comes to his class, carrying a large glass jar and a bag of ping-pong balls. He opens the bag and pours it into the jar, filling it up with the balls, There's a caveat to this book's 5 stars - do yourself a favour and learn about structure first. Learn it well, then come to The Plot Whisperer. Once, a philosophy teacher comes to his class, carrying a large glass jar and a bag of ping-pong balls. He opens the bag and pours it into the jar, filling it up with the balls, until no more fit. Then, he turns to his students: "Would you say this jar is full?" The students answer, obviously: "Yes." "Well, I disagree." The teacher proceeds to pick up a bag of gravel, and pours it into the jar - the small pebbles fitting into niches and crannies formed between the balls until no more can fit. "What about now? Now would you say it's full?" The students, again have to agree: "Yes, it's full." "It's not." Says the teacher. He reveals a bag of sand, and pours it in. The tiny bits of sand can find space where none seemed to be and he tops the jar off. "What about now?" The students are sure nothing more can fit. The sand is tiny. So they say "Now it's really full." "I can't fit anything else in there, can I?" The teacher asked. "No. It's full." The students answered. "I'll beg to disagree." The teacher then takes the jar to a tap, and proceeds to fill it up with water, which finds space between ping pong balls, gravel and sand. He turns to his students, and shows them the jar. "Now, it's full. Before, you focused on the big things and believed that, just because they took up lots of space, they truly filled it up. What really fills it up are the small things. In your life, large topics like your job, your money, your social status make you think you have a full life, but actually it's the tiny things that really fill them. Things like friends. Loved ones. Family. Values. Those are the small things that make your life meaningful and full." This lovely tale aside, upon reading this book, I found myself being filled up with water: before, I had studied structure extensively. I had studied several methods and tweaked and changed, and adjusted, and tried out and realized I knew how I wrote best and how I could write a book I was happy with. I operated under the belief that the more knowledge I acquired the better, but that I had pretty much learned all I had to learn. I learned something new in every page, and that is amazing, especially if I consider I do love structure and read on it extensively, and actually had classes with a strong component of it. I find myself understanding how story works at multiple levels, and how I can make a "solid structure" into a deep and meaningful one. As I read it, my NaNoNovel (that I postponed for too long to plot) reared on the back of my mind, wanting to be plotted. I had ideas for scenes, imagery even entire chunks of plot. I had ideas for themes and how they worked perfectly in the main story. I reached a sort of epiphany that I didn't think possible because I was already so full with knowledge. Don't go into this book expecting solid, ping-pong-esque chunks of knowledge about structure. You'll have to get those somewhere else. This is a book not meant for total beginners - instead of those, I got water. So much water that I thought I was going to burst. I thought I had most of the knowledge down -- instead, each page taught me something new, and filled me up a little more. Look on any writer's shelf and you'll discover what their weakest link is. If they can't structure a sentence to save their life, then you'll find a boatload of grammar books. Character development? You guessed it. How to bring your protags and antags to life. Come on over to my house, and you'll see quite a collection of books on plot. So here's another one...one I just might set on a display stand. The Plot Whisperer is chock full of hands-on, real world ideas that can shore up a sagging plot be Look on any writer's shelf and you'll discover what their weakest link is. If they can't structure a sentence to save their life, then you'll find a boatload of grammar books. Character development? You guessed it. How to bring your protags and antags to life. Come on over to my house, and you'll see quite a collection of books on plot. The Plot Whisperer is chock full of hands-on, real world ideas that can shore up a sagging plot better than duct tape and two-by-fours. Really. I've dog eared and highlighted this baby until it barely resembles a book anymore. And I've taken to quoting it on my blog. But why? Because author Martha Alderson communicates effectively how to breathe air into a lifeless plot. Throughout the book she sprinkles writing challenges (called Plot Whispers) and concise encouraging tidbits (The Writer's Way). After reading yet another plot book, this one leaves me not only encouraged but energized to plan out my next book. When that didn’t wor My first fantasy novel has become an ongoing project that has sucked me in and spat me out countless times. My plot as a whole is solid, but the beginning has been a challenge. When I say that, I’m being polite. Hands down the best book on plot and structure I have ever read. Whereas many other books describe structure decently well, M. Alderson raises the bar and answers all your questions, from plot conception to emotional development to thematic flair, beginning with: "How do I start??" The book is peppered with encouragement and advice, as well as numerous examples from modern best-sellers and Classics. This is a must-read for anyone, experienced or not. After finishing Stephen King's On Writing, I've come accept that this type of left brain plot formula isn't for me. I'm an intuitive writer. Like King describes, digging the fossil out of the ground. Nothing wrong with how the book is written. I just glaze over. Dull as dirt, this approach to writing. Not sure whether to rate this as three stars or four. Maybe three-and-a-half will work. An interesting look into plotting a story, but I'm still not quite sure what a "universal story" is and how people's stories fit into it. And at some points it seemed like the advice was a little heavy handed, demanding that plot be injected into every pore of your work. Then again, apparently I'm a right-brained writer, so I'm, I guess, against structure or something. Has some interesting tips, but I don't con Not sure whether to rate this as three stars or four. Maybe three-and-a-half will work. An interesting look into plotting a story, but I'm still not quite sure what a "universal story" is and how people's stories fit into it. And at some points it seemed like the advice was a little heavy handed, demanding that plot be injected into every pore of your work. Has some interesting tips, but I don't consider writing a book to be akin to some journey of self-discovery. Not for myself. My book isn't about me. It's about the character(s) I'm writing about, it's about THEIR journey, and while writing a book is certainly a challenge, it's not, for me, a challenge of finding yourself, unless that's what your book is about--your journey to self-discovery. There are a great number of good things about the book. I like the concepts and learned a good bit. Alderson has a "new age" approach and I think it's excellent. I read the first few chapters of this book (it's not very long and a pretty quick read.) but I started to feel like the book was a little...smothering? I started feeling like all my creativity was leaking away I decided to take a break. I almost went back to finish it, and one day I might, but it was due at the library and I didn't want There are a great number of good things about the book. I like the concepts and learned a good bit. Alderson has a "new age" approach and I think it's excellent. I read the first few chapters of this book (it's not very long and a pretty quick read.) but I started to feel like the book was a little...smothering? I started feeling like all my creativity was leaking away I decided to take a break. I almost went back to finish it, and one day I might, but it was due at the library and I didn't want to renew. At first I thought that there was little about plot that I hadn't read before. But then the author described right-brain and left-brain writing, the emotional journey of the protagonist and how our personal thresholds shape our souls to become great writers. I took lots of notes on character development and I can't wait to apply many of these ideas to my next project. I absolutely loved reading this - it got me so excited to sit down and write. Beyond books about motivating yourself to write, I hadn't read anything about the actual process and this book nailed it for me! A must read for any writer! One-sided advice for plotters. She may talk about pantsers, but she isn't helpful for them. 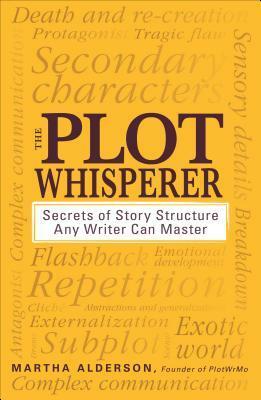 Like a lot of "how-to-write" books, The Plot Whisperer is a well-written and well-intention book that breaks down the fundamentals of story structure. But the age-old adage of the road to hell is paved with good intentions applies at times to this book. Martha Alderson bombards you with a lot of hacky New Age-jargon and an overly strict, overly reliant emphasis on story structure that feels more like work than actual writing. There's nothing really wrong with this book, per se. It's simply overw Like a lot of "how-to-write" books, The Plot Whisperer is a well-written and well-intention book that breaks down the fundamentals of story structure. But the age-old adage of the road to hell is paved with good intentions applies at times to this book. Martha Alderson bombards you with a lot of hacky New Age-jargon and an overly strict, overly reliant emphasis on story structure that feels more like work than actual writing. There's nothing really wrong with this book, per se. It's simply overwhelming at times. I admire Martha Alderson for what she's accomplished and what she's taking on her, but she does come across as an overly-talky guru that spends way too much time talking theory, and not enough time getting you, the writer, to do the practical nuts-and-bolts things that make you a better writer. It's like the hitting coach that spends hours and hours and hours talking theory, and tinkering and tinkering and tinkering with your swing. Your head is filled with all kinds of ideas that are pulling you into a thousand directions, which is bad, and your mechanics are totally off. Sometimes, all you need to know is "see the ball, hit the ball." Okay, forgive the baseball analogy. There are so many books on writing, and some wash over you, and some just click. This was the latter for me. I was a bit worried at the start when the author mentioned she was into energy and healing, but actually the use of "energetic points" (nothing more than first turning point, second turning point, crisis and climax) around which your story must be constructed was helpful to me, as my writing suffers from a lack of excitement and direction. The descriptions of how your story must develop an There are so many books on writing, and some wash over you, and some just click. This was the latter for me. I was a bit worried at the start when the author mentioned she was into energy and healing, but actually the use of "energetic points" (nothing more than first turning point, second turning point, crisis and climax) around which your story must be constructed was helpful to me, as my writing suffers from a lack of excitement and direction. The descriptions of how your story must develop and along what lines were clear, and the tools (a plot planner, or story chart, and scene tracker) were just what I needed. I enjoyed this book and will definitely be keeping it. Ms. Alderson takes the basics of story structure and applies two visual techniques for the writer to see how they are progressing along the story arc and the plot. Not a book for non-outliners, although she is very supportive for those who choose to write that way, she does encourage giving much of the plot previous thought and mapping out, utilizing visual learning as a way to help stay on track. It's not a dry textbook kind of writing guide I enjoyed this book and will definitely be keeping it. Ms. Alderson takes the basics of story structure and applies two visual techniques for the writer to see how they are progressing along the story arc and the plot. Not a book for non-outliners, although she is very supportive for those who choose to write that way, she does encourage giving much of the plot previous thought and mapping out, utilizing visual learning as a way to help stay on track. It's not a dry textbook kind of writing guide. She encourages the writer to stay in touch with their center, to tap into those intuitive places and pull from within those things that would deeply benefit the writing experience by drawing on the personal. I've been poring over this book for months. I took it out of the library twice, then ordered a copy. I'm writing middle grade, and plotting is tough for me. This book is loaded with ideas and specific strategies and instructions. It has really helped me move forward with my current project. I like the idea of "energy markers." Of course, I wouldn't take any writing "how-to" book as gospel, but it is loaded with inspiration. Martha Alderson has instructions throughout for ways that writers can ge I've been poring over this book for months. I took it out of the library twice, then ordered a copy. Of course, I wouldn't take any writing "how-to" book as gospel, but it is loaded with inspiration. Martha Alderson has instructions throughout for ways that writers can get over their own blocks. I must admit that I totally skipped that part. For me, it didn't detract in any way, since those parts were clearly marked. It's generally considered un-couth for literary writers to study what is considered formulatic story structure, but this book helped me a lot. It gave me just the idea I needed to shape a short story I was struggling with. I am now purposely reading similar books looking for structural ideas and I don't care who knows it. Ha. This book has been instrumental in helping me as I work on ironing out plot issues with the first draft of a novel. It is clear and well written and has many useful exercises and examples. It also offers a blueprint for helping devise storylines that will engage readers. This is reading very well so far. It has identified a few problems I have encountered with my work. Love it! This book talked a lot about the universal story, but I had a hard time envisioning that every story would fit this pattern. Some useful tips. A little bit too preachy. Inspirational, I guess, but it is light on actual techniques and heavy on writing to a formula and personal encouragement. Close to 4 stars, but couldn't quite bump it up. There are a lot of helpful takeaways from this book about how to structure a plot, it helped me brainstorm on my new novel, and I took several notes that I plan to reference as I write. I also appreciate the emphasis on actually writing the damn thing—the encouragement to not spend forever dithering in planning and outlining. I didn't find much inspiration in the "universal truth" pep-talks. Also, the author's analyses of other works of f Close to 4 stars, but couldn't quite bump it up. I didn't find much inspiration in the "universal truth" pep-talks. Also, the author's analyses of other works of fiction were so superficial that I doubted the writing advice at times. This book takes the idea of themes beyond foreshadowing. I read it for free. As a beginner, it help me understand the notion of building momentum in emotional character development. For example, I realized that the character in my story needed to change her perception of a friend as the story progressed. It’s a rough draft, and so the behavior of the friend in question ‘is what it is’, rather than a reality as seen through the eyes of the protagonist. MARTHA ALDERSON is passionate about helping you live your best creative life, realize your artistic ambitions, and she invites you to embark on a spiritual odyssey to higher creativity. She is a historical novelist and international transformational guide for creatives and plot consultant for writers. She was born in San Francisco as a 5th generation Californian. She has written eight plot and writing books for writers, including the bestselling THE PLOT WHISPERER and WRITING DEEP SCENES and her latest release WRITING BLOCKBUSTER PLOTS. Martha has been exploring and writing about the Universal Story for the past twenty years as part of the plot support she offers to writers. She first introduced the Universal Story in The Plot Whisperer to transform writers' creative lives and to "show" plot. More recently, she has expanded her work to include helping people transform their creative lives. She has produced 4 on-line video courses for writers including: The 27-Step Tutorial: HOW DO I PLOT A NOVEL, MEMOIR, SCREENPLAY?, A SPIRITUAL GUIDE FOR WRITERS: SECRETS OF PEROSNAL TRANSFORMATION, and PlotWriMo: REVISE YOUR NOVEL IN A MONTH.